VON ORMY—The Southwest Dragon Swim Team is coming to the end of a record setting year. On February 1, 2014, the Dragon Swim Team competed in the UIL District 28 5-A Championship Swim Meet at the Aquatic Center at Palo Alto College. At the meet the Dragon Swim Team broke four school records in four relays and twelve athletes have qualified to compete at the UIL Region 7 Championship Swim Meet to beheld at the Josh Davis Natatorium on Feb 7th—8th. 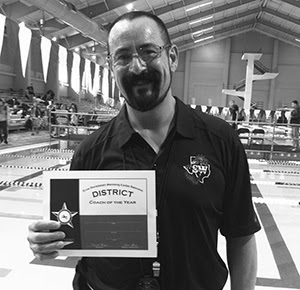 Southwest can attribute its recent success to Coach Hernandez whose coaching talents were recognized this year by being named the District 28 5-A Boys Swim Coach Of The Year for 2013-2014.